Are you juggling career and family? Do you find your free time stretched between your baby and older children? If you think you're too busy to learn how to teach your baby or child, you've come to the right place. If intelligence is the ability to learn, then babies are born geniuses! While a baby's brain has the potential to learn just about anything, parents have an important role to play in determining just how much - and how easily - their baby learns. Here, we discuss the key issues to bear in mind when teaching your baby. 2 Why is early learning so important? The period from birth to age eight - and especially, from birth to age three - is a critical time in baby brain development. This is because the first years of life lay the neurological foundation for intellectual growth into adolescence and adulthood. From the moment of conception, the neurons (nerve cells) of the brain multiply faster than any other cells in a baby's body. The rapid pace of baby brain development continues into early childhood: at birth, the brain weighs 25 percent of its adult weight; by age one, 50 percent; by age two, 75 percent; and by age three, 90 percent. 3 What can I do during pregnancy? If you are pregnant or have a special interest in the prenatal period, be sure to check out BrillBaby's Prenatal Education section. 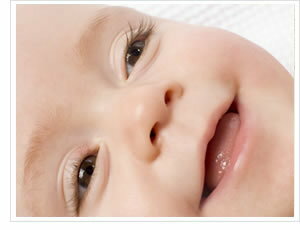 Full details of how to teach your unborn baby can be found in the article Stimulating the Senses. There are so many ways that you can interact with your baby during pregnancy! In particular, you can provide auditory stimulation from 20 weeks (when your baby's hearing becomes fully developed), and tactile stimulation from around 28 weeks (when you will start being able to feel the baby through Mom's belly). 4 What can I do after birth? Above all, now that your baby is finally here, you should enjoy interacting with her as much as possible. Talk, read and sing to your baby. Hug, cuddle and kiss her. Spend time playing with her, following her lead once she is old enough to show you what interests her. Enjoy this special time when your child is small - it will pass by all too quickly! Besides the essentials above, there's plenty more you can do to engage your baby's brain. Auditory and tactile stimulation remain important, as they were in the womb. You can also help your baby develop his motor skills - as well as teach your baby to read before he starts school!